(Tampa, FL) – The inaugural Tampa Poker Classic kicked things off with a big, multi-day tournament that set a great pace for the series. More than 1,000 entries got in the game and it was 2017 WPTDeepstacks Tampa Main Event final table member Andrew Boccia outlasting them all, taking the title and nearly $50,000 after a five-way deal. Event 1 drew 1,128 entries over the six starting flights to push the $200,000 guaranteed prize pool up to $338,400. Only 179 advanced to Day 2 on Sunday with Todd Doan leading the field. Unfortunately for him, a series of bad beats and second best hands sent him out short of the money with 113 getting paid. The bubble burst after the first break and it was a steady parade of eliminations getting in line for their payout. There were only 15 players remaining on the dinner break and they were down to the final table within one level. Philip Starner began the final table with the chip lead but Boccia was not far behind. Christopher Boyle spent some time on top of the counts after sending Dan Kennedy and Ed Vasconcelos out at the same time with a two-out river to start the action at the ten-handed table. Boyle’s lead did not last long as Boccia went on a heater until only five players remained. They made a deal to divide up the remaining prize pool and Boccia took the lion’s share of $46,255 plus a seat in the $300,000 Guarantee Main Event. This was the second biggest live payday for Boccia and only a few hundred behind what he picked up for his fourth-place finish in the 2017 WPTDeepstacks Tampa Main Event. Congrats to Andrew and thanks to our players for a great kickoff. After Eddie Kofler was eliminated in sixth place, the five remaining players decided to enter discussions about dividing up what was left of the prize pool. Andrew Boccia owned the biggest stack by far and he negotiated his way to the top paying position plus a bit more. He earned $46,255 plus Boccia now owns a seat in Flight A of the Tampa Poker Classic Main Event on Thursday. Eddie Kofler open-shoved for ~1,100,000 and Christopher Boyle called in the small blind with the much bigger stack. Kofler was in great shape and faded the flop. The turn was no problem either but Boyle hit another river, this time the , to send Kofler out in sixth place. Andrew Boccia opened to 425,000 from middle position and Thomas Leonzio shoved from the small blind for 1,750,000. Boccia asked for a count and said “I’m probably calling” as the dealer broke down the stack. He called. It was a race and Leonzio needed to catch to stay in the game. It wasn’t meant to be as the dealer spread the all low board and the chip leader made a boat to send Leonzio out in seventh place. Dinner time leader Edward Muniz was down to 2,400,000 and put those in the middle. Andrew Boccia called to put him at risk and it was another cooler. Muniz had to like his queens when he first saw them but they were no help as the board ran to send him out in eighth place. Dan Kennedy open-shoved for 1,175,000 from middle position and Christopher Boyle called from the button. Ed Vasconcelos moved all in the small blind for only 125,000 more and Boyle called having both covered. Vasconcelos had the best of it but Kennedy took the lead on the flop. The turn improved Kennedy to a boat but Boyle jumped when he spiked the river to send both out. It was a quick path to the final table after the dinner break and they got there when Philip Starner returned a cooler to Alex Ivan. Earlier Ivan took a big pot when both flopped trip jacks but Starner’s king kicker was beat by Ivan’s ace. With 11 remaining, Ivan had pockets tens and ran into Starner’s pocket aces to send Ivan out in 11th place and set the final table. The tightened play late in the day has shortened the average stack and we should see a lot of movement when they return. William Muniz leads the way with 3,250,000 and Naresh Parwani is the only other player over 3 million. The 15 remaining players are taking a 40-minute dinner break while the 5K chips are coming out of play and the yellow 100k is introduced. We will post the two-table lineup and counts while they are gone. Action folded to DeVaughn Smith and he moved all in for 340,000. Daniel Kennedy, next to act, quickly called and the rest of the table folded. Smith had two live cards but Kennedy paired the flop. That prompted Smith to begin gathering his things and it was settled after the turn and river. The backlog was broken and we lost another handful of players to get the field down to the last two tables with the dinner break on the horizon. We will grab the new lineup and chip counts on break. There was little action during Level 26 and they rolled into the next blind jump with 24 players remaining. That should loosen up over the next two levels before the dinner break. Here is the table lineup and we will grab counts as we progress. One reason for the slowdown in eliminations is the logjam near the top of the counts. Several of the previous big stacks came back to the field and there are a handful in the 2,000,000 range. The biggest at the moment looks like Andrew Boccia but that could change in a hurry. They will play three more levels before the remaining players take a 40-minute dinner break. It took a little while to break the slowdown but Event 1 lost three players shortly before the break. The remaining 24 players made another pay jump with everyone guaranteed at least $2,189. While there is a big slowdown in Event 1, no players eliminated in nearly a level, we decided to peek at the Event 2 field. They are into Level 8 and it’s the last chance to register for the big eight-handed tournament. They’ve already blown past the $20,000 guaranteed prize pool and the doors will close at 6:30pm after the next break. We’re seeing plenty of players jump from Event 1 into Event 2 including Wally Maddah, Cheri Beatty, and Brandon Byars. In a snap, Event 1 is down from 179 players to the three-table redraw with 27 players remaining less than six hours after the restart. It took a little while to go from 28 to 27 but they got there when Sean Hampson sent Chuck Lum out late in Level 24. Tournament staff paused the clock and they are drawing new seats. Kristopher Villanueva open-shoved for 350,000 and Stephen Dees called on the button. Wayne Daley called in the big blind but did not realize Dees was along for the ride, almost prematurely tabling his hand. The flop came and Daley immediately put Dees all in for his last ~370,000. Dees thought for a moment and called for the big three-way pot. Daley woke up to a big blind monster and it held after the turn and river for the double knockout. The rush continued after the break and Event 1 is down to the last five tables of the tournament. Daniel Kennedy is taking his turn at the top of the counts with only a nip under 2,000,000. His 1,985,000 is good enough for the current lead but things are in motion. Jacqulyn Kagan asked if she was the last women standing, and after a quick look around the remaining tables, we determined that she was indeed. She has a little work to do with her stack but she’s fighting the good fight. Level 21 came to an end and the rest of the Event 1 players could take a breather as the payout line caught up. They are down to the last six tables with another four levels to grind it down further. Before they went on break, Alex Ivan and Hamid Izadi went to battle with Ivan getting his 607,000 stack after a queen-high flop. Ivan was good with pocket queens against sevens and made a huge double to 1,450,000. “I made a bad read of his hand,” Izadi admitted. Wayne Daley was already on the verge of crossing into seven-digit territory and got there on a fortunate turn. He had an opponent all in and at risk but his was dominated by . The flop changed nothing but he binked the turn to take the lead. The river finished the board and Daley moved up to 1,200,000. He isn’t the only one running up a stack. Thomas Leonzio began Day 2 with 209,000 but now sits with 1,100,000 as players drop all around him. After the bubble burst, we have witnessed a long, steady parade to the payout desk. The tournament clock shows 74 players remaining and 98 have processed their Event 1 cash with more than a few in line. It took less than five minutes into Level 18 for Event 1 to hit the money bubble. Tournament staff paused the clock and they will play hand-for-hand until one player is eliminated. The clock will be paused with two minutes coming off per hand until they make the money. Action is about to get back underway after the color up break and Event 1 is only two eliminations away from bubble play. Philip Starner is among the top stacks in the room heading to the money with more than 700,000. We found another stack over 800,000 and will identify that player once they put cards back in the air. Event 1 is nearing the bubble but the first break is closer. They are less than a dozen eliminations away from the money with only ten minutes remaining in the level. Once Level 17 is complete, they will take their first break of the day as the 500 denom chips come out of play. There were plenty of top players making it through to Day 2 including Bryce McVay, Brandon Miller, and Nick Palma along with Willy Maddah, Marvin Kharlins, and Travis Jackson. They are all still around with a chance to make the money. Unfortunately for some, the list of those who fell short included Parm Mehmi and starting Day 2 chip leader Todd Doan. Not everyone in today’s restart is a Tampa regular. 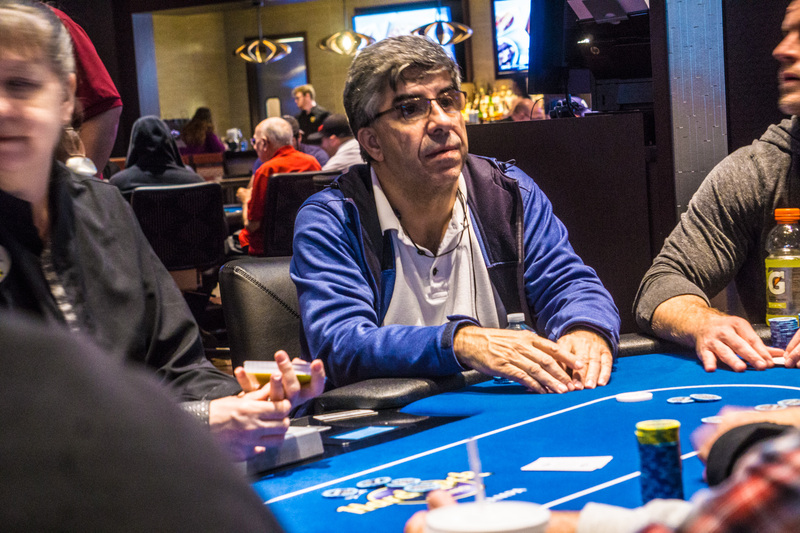 Some are making their first visit to the poker room including Hamid Izadi. The Georgia grinder has results all around the country and his latest came at our sister property in Coconut Creek. Izadi went deep in their WSOP Circuit Main Event and cashed out in fourth place for more than $86,000. A near miss on his second WSOPC ring. Izadi was road tripping with some friends after that series, heard about the Tampa Poker Classic and made Day 2 of the opening Deepstacks Challenge Event 1.